Photo courtesy of Ryan Jones. Mom! Look! It’s a window washer. can I feed it? But they’re right outside the window! Who’d notice if I took a quick bite? I’m saving the bread crumbs to feed the exterior window washers. don’t do that, they will defecate everywhere! they have a special diet. and no feeding the maids either.. They hate it when you throw peanuts in their buckets of water. Apparently if you feed them, they will follow you home. If you do, they won’t leave. If you feed them, they will become dependent on humans for survival and will never learn to fend for themselves. I can’t get the food through the glass anyway. We can’t have stains and odours trickling down the walls! 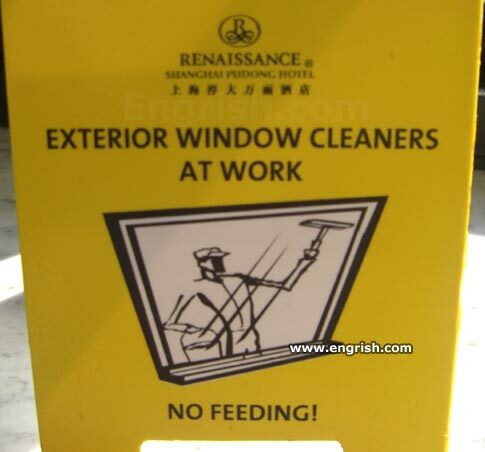 We’ll then have to employ wall cleaners, and who knows, they too will accept food! I went to a rotating restaurant recently, and I saw a window washer’s cage, so I got out a piece of paper, wrote, “Window Washers DO NOT FEED $500 Fine” and put it in front of the window. FOR THE LOVE OF GOD!!! THE SCAFFOLDING CAN HOLD ONLY 82.4 KILOS!!! Yeah, cause nobody likes EXTERIOR window washers. Their more into INTERIOR window washers. We are in the process of installing Window-Cleaning Person pellets. Please be patient and don’t feed them any people food. These “renaissance” window-washing-men are on a strict mideival diet. please do not annoy, pester, molest, worry, badger, harry, harrass, hackle, persicute, irk, rag, vex, bother tease, nettle, tantalize or ruffle them either!!! they know the vampires around…. Please do not tap on the glass. – But look Mommy, they’re cooing!